Every gardener knows that a surplus inevitably results from even one zucchini plant. Heat and humidity saturate the July air in much of the country. Not here in California. Fog slurps up any daytime heat and casts an evening chill, even in the depth of summer. I always imagined that warmer climates were the only ones to produce county-fair-ribbon-worthy vegetables. That’s where I saw them growing up: at the California state fair, my grandparents’ house in Missouri. Until this summer, when my mother and I planted a vegetable garden in her backyard. We dug out packets of seeds from the laundry room that must have been ten years old, from the last time she had a diverse garden. Chives, kale, spinach, carrots, peas, four types of lettuce, and zucchini. I think the zucchini seeds were oldest of all. Seduced by the blank slate of fresh soil, we planted everything, packing seeds in tight rows. Those veggies faced tough conditions. First they went for a week without water. Then the April rain came down so hard we thought the seeds had washed away. Now, months of not-too-hot-and-humid-weather later, the garden is brimming with vegetables. Especially zucchini. I don’t particularly care for zucchini, but when I brought home an eight-pound squash last week, we spent the week eating it disguised in many creative forms. 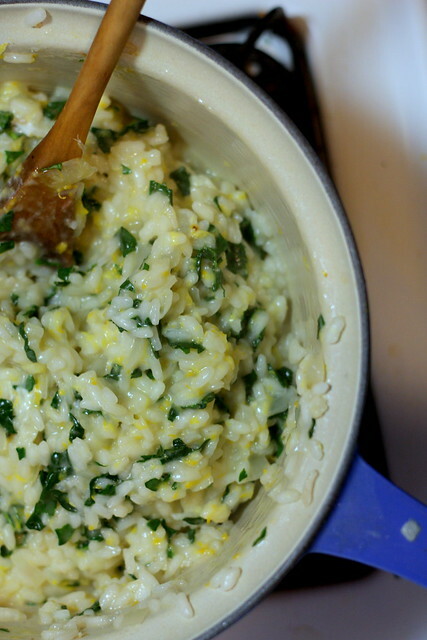 The most creative, most consumptive way to use the surplus that we found was zucchini-zagna. Or maybe it’s zucchini-za? I think I’ve finally settled on zuke-zagna. This is essentially a classic lasagna, but with zucchini instead of noodles. It’s gluten-free when made this way, and could be vegetarian if you just left out the meat and used something like mushrooms instead to beef up the tomato sauce (so to speak). 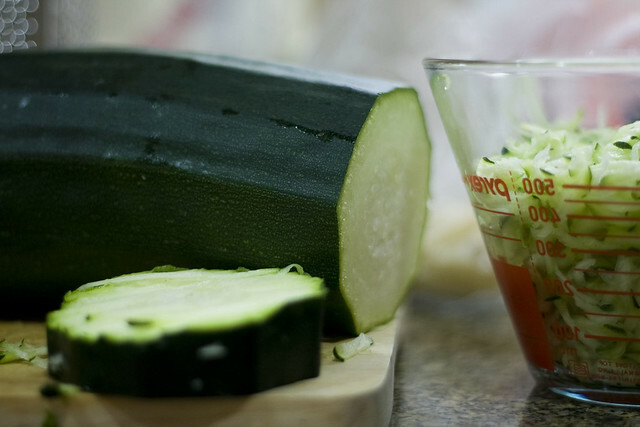 Slice zucchini thinly and salt it. After 30-60 minutes, rinse thoroughly and pat dry with paper towels. Heat 2 tbsp. canola oil in a skillet on high heat. Add both meats and brown them until cooked through, stirring occasionally to brown evenly. Once meat is mostly cooked through, turn heat down to medium. Add onion and garlic and cook until onion is almost translucent. Add tomato sauce, wine, and herbs to meat and onion mixture, and simmer for 15 minutes on low. This is an ideal time to rinse and dry your zucchini slices and whip up the ricotta. Speaking of which, in a separate bowl, mix the ricotta with the eggs and grated parmasean cheese. Taste the sauce. Is it too acidic? Add some sugar! Not acidic enough? Add a splash of red wine vinegar. Not salty enough? DON’T ADD MORE SALT YET. The zukes will take care of that one. Assemble the pieces: Start with a layer of zucchini slices, then add a layer of ricotta mixture, then tomato-meat sauce, then the mozzarella. Repeat two more times. 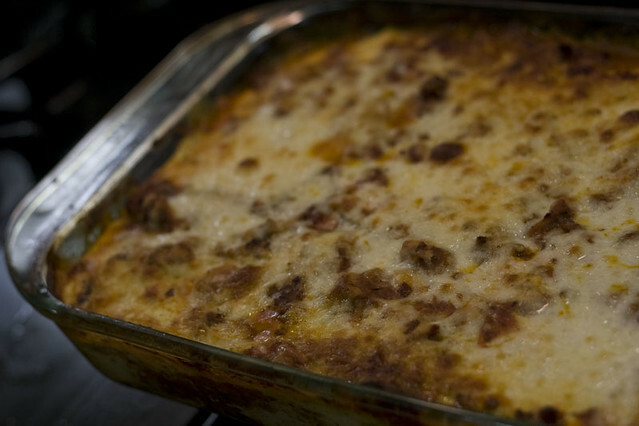 Bake for 40-45 minutes, until cheese is bubbling and starting to brown on top. 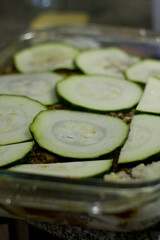 Remove from oven, serve, and enjoy your surplus zukes.